Use: 1/2 tsp (makes 1 serving), adjust amount according to taste. Ingredients: Oligosaccharide, Oleoresin Capsicum (Hot Pepper Extract), Salt, Vinegar, Oleoresin Paprika, Monosodium Glutamate (E621), Xanthan Gum (E415), Water. 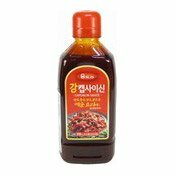 Simply enter your details below and we will send you an e-mail when “Korean Hot Capsaicin Sauce (韓國辣醬)” is back in stock!